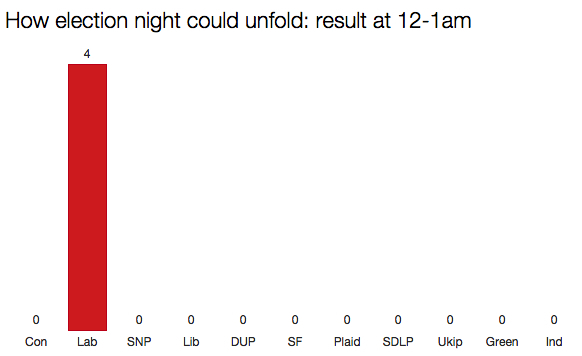 I’ve had a go at plotting how election night could play out, including when each party will make gains and where seats will change hands. 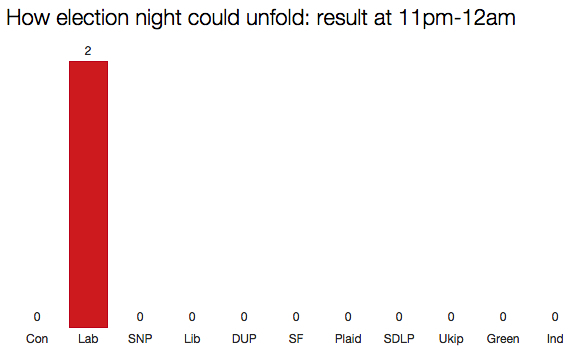 This isn’t a prediction of the election result. Rather it’s a template for what could happen hour-by-hour, and there are bound to be plenty of deviations from this scenario on Thursday night. Saying that, the outcome that I reach is just as likely as any other. Two safe seats for Labour to begin with, both in north-east England. Two more safe seats for Labour from its north-east heartland. Results from Northern Ireland start to come in, plus a safe seat for the SNP and half a dozen more safe seats for Labour. The first gain of the night is also due: Nuneaton, which Labour is hoping to take from the Tories. The first Tory seats will declare, along with more from Northern Ireland including Belfast East which the DUP is hoping to take from the Alliance. The SNP should start to gain seats from Labour in this hour, while Labour is eyeing two more gains from the Tories: Northampton North and the City of Chester. Results will start to flood in from 3am onwards, with declarations due in dozens of safe Tory and Labour seats. Ukip will hope to gain Thurrock, Labour could make 10 gains from the Tories and Lib Dems, but lose a similar number to the SNP. Labour should move past 100 seats, with the Tories not too far behind. A torrent of safe Conservative seats will push the party’s total past 150. The Tories could make their first gain of the night in Devon North, while over a dozen more Labour seats may fall to the SNP. The Lib Dems will move into double figures. The gap between Labour and the Tories will narrow to a tiny handful of seats, and both will make gains from the Lib Dems. Ukip will hold Clacton. 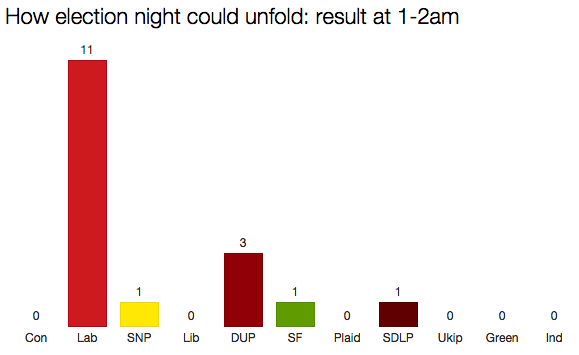 All the results from Northern Ireland will be in, and Plaid and the Greens will have reached their maximum totals. 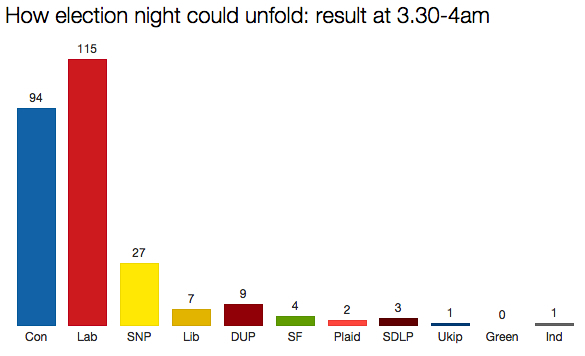 Dozens of Tory and Labour safe seats will push both parties above 200, and Labour could make as many as 14 gains. The Tories move ahead of Labour for the first time, while Ukip wins its third and final seat in Thanet South. Labour will still be making gains, however, as will the SNP. 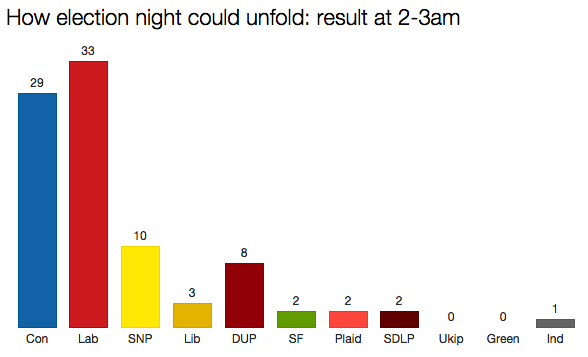 Some late safe Labour seats could push the party back in front by a tiny margin. The SNP is set to make one final gain in Ross, Skye & Lochaber. The results will then dry up until Friday lunchtime. A final gain for the Tories in Berwick-upon-Tweed pulls it level with Labour, while the Lib Dems will hold St Ives in possibly the final result to declare. Wow I can see why this one wasn’t put on the blog until mid-morning: obviously a lot of work! Definitely going to be following this list as the results come in and seeing how you do. Not convinced by a couple of predictions but I reckon you’ve probably judged about 80% of the marginals correctly. Cheers. It’s more of a guide rather than a prediction – hence the 275-275 outcome – but my instinct is that the actual result won’t be that much different. Fantastic piece of work, Ian: thanks very much for putting it together. It’s made me realise that instead of watching it from the beginning but dozing off around 2am and waking up a couple of hours later having missed much of the excitement, I’m going to wait for the exit poll, then try to catch 4 hours sleep until 2am when all the real action starts. Hope you enjoy the show. Yeah that’s the way to do it, unless you are holding/attending an election party there’s not much point sitting through the whole eight or nine hours. I’m going to be watching this one alone, which will be a change from five years ago when I was at uni and we were all crammed into the student bar to watch it. Think I will prefer it in many ways – as a floating voter in a room of fairly partisan people, it wasn’t always the best vibe – and the bar running out of Red Bull at about 4am didn’t help. Thanks for that – very detailed. 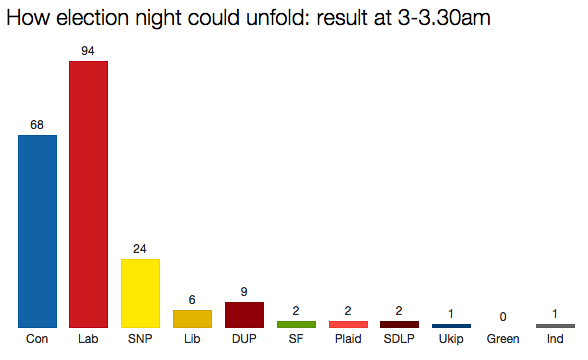 I think I’ll go to bed as normal and try and get up in time for Sheffield Hallam declaration bet, which will be one of the key moments of the night – maybe that one goes to a recount so could be later than 4:30am – 5am? I’m amazed with all the opinion polls flying about that we need to bother with an election at all as everybody seems to know what the result will be. Apparently approximately 40% of voters have yet to make up their minds so although I go along with most of your predictions expect a view surprises. I would not be surprised if UKIP picked up a couple more than the 3 expected, the Lib Dems to hold on to more seats than expected and the SNP to win fewer than the polls suggest, and finally 5 more years of a Con/Lib Dem coalition as the voting public suddenly realise that Ed Miliband might just be PM. I’ve really enjoyed your blog and will have this page open when the results come in. Whatever happens expect Cameron to cling on for dear life until he is physically ejected (if it comes to that of course). I agree that David Cameron will remain prime minister for as long as possible, but he is entitled to do so, and could well be in Downing Street at least until the end of the month. I think you are wrong Simon. The way I see it the only certainty is that Cameron will be out (in due course) and that makes me feel a whole lot better. I want to live in a Country that values community not one run by a dysfunctional PR outfit bankrolled by the better off to protect their own interests above those of the majority. All this pre-election hot air is a waste of time. Labour will always be Labour and Conservatives will always be the Conservatives (The bedroom tax is simply a PR exercise to appease the Daily Mail readers with no regard to the increased suffering caused to the small number of unfortunate members of our community who, for a number of reasons, can’t cope as well as the rest of us). Another 5 years of Cameron would mean more chunks of public services being cut increasing the UKs decline towards 3rd world status. We will end up like so many 3rd world Countries where they pay little tax, have no public realm infrastructure and no healthcare or social services. I note that the only parties that would consider joining the Conservatives are UKIP (perhaps) and the LibDems (probably) and the later will have their numbers halved because they enabled Cameron to form a Government 5 years ago. I voted LibDem 5 years ago – I never will again. Who would I like to see in office? ANYONE BUT THE CONSERVATIVES. Sorry, I thought this was a prediction on what MIGHT happen, not what you WANT to happen. My apologies Steve I got carried away. I started out to simply say in response to Simonc’s comments that predictions suggest that Cameron will not be in office when the process has run its course. I can also see Teresa May as leader of the party…….here I go again……..I am not a regular blogger I must learn how to do it. Interesting to note that only 7 seats are counting Friday (those which you have declaration after 8.00am). It has been many more in previous elections and last result has declared at 6.00pm or later. Obviously some declarations will be deferred due to recount for winner or recount for saving deposit. Results are what we wish to see but I wonder how accurate Exit Poll will be. 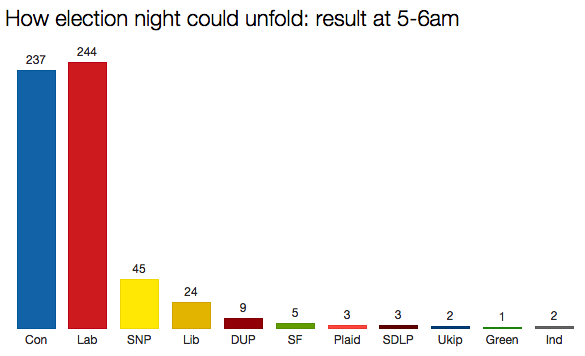 I assume you are making a final GE2015 seat prediction in the next couple of days? Yes, I’ll do a final prediction on Thursday. Ian, you are incredible. As an ex-pat election junkie following from the US, I have loved this blog from the minute I discovered it a couple of months ago. Well done. I really think your level of analysis deserves a bigger audience. Have you thought of applying for Peter Snow’s job? I suspect those “in the know” at the mainstream press are following this blog, and we might well see similar stories elsewhere in the next day or two. That’s why Ian “deliberately” listed Hastings & Rye as a safe Conservative seat – to detect plagiarism amongst anyone else who publishes a similar article. Well done for spotting the, ahem, deliberate mistake! Ditto Norwich North safe Con?…. That’s not a mistake. My instinct is the Tories will cling on, albeit with a much reduced majority. Fair enough….and a good chance you’re right. Was just surprised it was in Safe given the majority and the Aschcroft poll rather than in Con hold……but a minor point. Thanks for the work on the guide though. Following obsessively from Nairobi and much appreciating your work.